Along with Gabriel Knight: Sins of the Fathers 20th Anniversary Edition, I also managed to get Valkyria Chronicles for Father's Day (I'm one lucky Dad!). I heard good things about the game from Choicest Games Contributor Luke and I was amazed to find what looked like a JRPG set in the European theatre of World War II. Of course, I turned out to be only half-right, but it was enough to colour me intrigued and so Valkyria Chronicles ended up on my Steam wishlist, and eventually in my library thanks to the generosity of my wife (although choosing to buy me single player games when I don't spend enough time with her as it is, was probably a foolish move on her part ;)). Anyway, 38 hours later, I've finally finished the game and it's time to see if this game is worth your time or not. And what is a Valkyria anyway (I don't actually answer this question, just letting you know. You'll have to play the game to find that out ;))? Valkyria Chronicles is basically set in a fictional Europe called "Europa" during a tumultuous period of history called the Europan War 2 (EW2). This is obviously modelled after World War II as there are similar powers vying for control of the continent and similar technology used to wage the war (except for the fact that everything is powered using this fictional resource called ragnite instead of oil). To the east, you have the Eastern Europan Empire (or just "the Empire" for short); an authoritarian regime that has advanced weapons and tanks, and is seen as the aggressor in the conflict. They also commonly use a race of people known as the Darcsens as slaves so you can see that there's a lot of parallels between the Empire and Nazi Germany. To the west, you have the Atlantic Federation; a commonwealth of allied democracies that often bicker amongst themselves often using bribery and extortion in order to achieve results, not really having the same level of technological superiority as the Empire. The Atlantic Federation is obviously a fictional representation of Western Europe or the Allies during WWII (although they're not exactly shown in a positive light in this fictional universe). The neutral kingdom of Gallia, which is where the main character, Welkin Gunther hails from, and where most of the game is set, seems to be a mixture of the Netherlands and Switzerland and at the beginning of Valkyria Chronicles, the Empire commences their operation to annex the nation. In terms of weapons technology, semi-automatic rifles, sub-machine guns, gatling guns and anti-tank rockets are common along with WWII-style tanks. Unlike WWII though, in EW2 aeroplanes have not been developed yet which means the tank definitely rules supreme in this game. I love the faux-WWII setting and the story of Valkyria Chronicles is told in the form of reading a book called "On the Gallian Front" containing several cut scenes. Usually the cut scenes are just of the visual novel format using the in-game engine, but there is also the occasional pre-rendered action cut scene as well. The only criticism I have with the plot is that it can sometimes see-saw between solemn, moving and profound, to childish, trite and patronising. The only criticism I have with the plot is that it can sometimes see-saw between solemn, moving and profound, to childish, trite and patronising. An example of one of the more ridiculous "episodes" is when your squad decides to have some R&R at the beach which is mainly just an excuse for some fan service by having the female squad members wear their bikinis. It didn't really do much to advance the plot and is definitely an oddity. There are also a lot of situations you come across that can be considered trite or clichéd since they happen in just about every WWII film created. However, I think Valkyria Chronicles can be forgiven in this regard since I don't think the Western Front in WWII is common subject matter for the original target audience (i.e. the Japanese) and despite most of the plot being clichéd, it's countered by some very moving scenes, like when the squad mourns for a friend or when two soldiers from opposing sides show respect for each other. 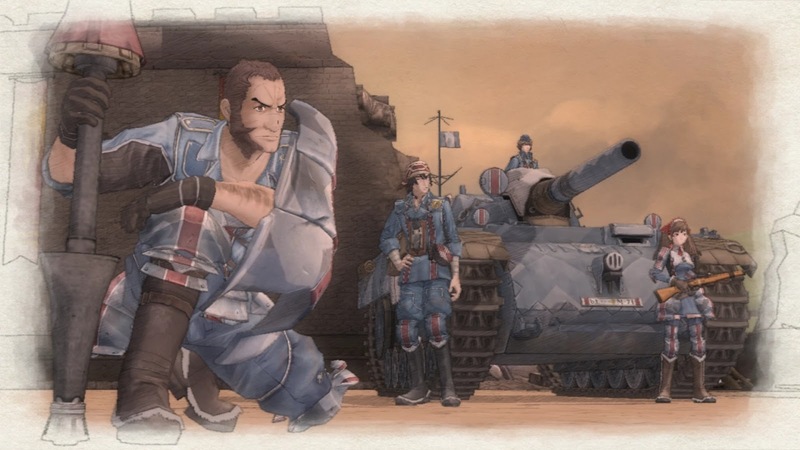 Valkyria Chronicles is at its heart a turn-based tactics game with RPG elements, similar to games like Jagged Alliance or X-COM, however there are some subtle differences; one difference in particular is how "overwatch" or interrupts work. In Jagged Alliance saving up action points before you end a turn gives you the opportunity to interrupt an opponent while they're moving during their turn, usually by taking a snapshot at them. In XCOM: Enemy Unknown, you have a similar means of doing this by placing your troops on "overwatch". So how does it work in Valkyria Chronicles? Well, provided the enemy is within line of sight of one of your soldiers and is in range of their guns, they will automatically fire on them when they pass by. They also get an opportunity to shoot back if they're still alive after the enemy has their go attacking them. Sounds easy enough right? Well the only problem here (especially when you're first learning the ropes) is that unlike other turn-based games where you get time to ponder your moves, you have to be prepared before you take your turn in Valkyria Chronicles since everything happens in real-time. You can't just stop next to an enemy and have a look around since the longer you sit there, the more chances they'll have to keep automatically firing on you. You'll get used to it soon enough but it's something to be aware of. You can't just stop next to an enemy and have a look around since the longer you sit there, the more chances they'll have to keep automatically firing on you. You'll get used to it soon enough but it's something to be aware of. Anyway, each side has a certain number of action points they can use to execute their turn (determined by which officer units you have in the game) and it costs one action point to move and/or shoot with an infantry unit and two turns to do the same with a tank. Objectives for each mission vary but it usually involves defeating a certain enemy or capturing a certain camp without losing your own camp. Camps can be captured using infantry and provide forward spawn points for more soldiers (although you only can field a certain number of soldiers at a time). Speaking of capturing camps, there are a few different classes of soldier in the game and the best at capturing camps are the scouts. Scouts are armed with a rifle and tend to not be weak but they're able to run further than any other infantry class in the game (which is why they're ideal for capturing camps). Other classes include the Shocktroopers who are armed with sub-machine guns which are perfect in close range engagements, the Lancers who are armed with anti-tank weapons, the Snipers who are equipped with sniper rifles and the Engineers who are armed with rifles, just like the Scouts, but are able to replenish ammunition, remove mines and repair tanks (quite handy). Usually using a mix of all these classes will ensure victory, especially considering infantry tend to use less action points than tanks. It's also worth mentioning that no two soldiers of any class are identical; they're both fully-fleshed characters with their own background, likes and dislikes (as well as different stats). Just like Jagged Alliance where each mercenary have their own idiosyncrasies, the same applies for Valkyria Chronicles. These can be positive ones such as when Jann, a gay former babysitter now turned Lancer (I'm not making this up), is near Largo, he will perform better in combat. Conversely, you have the deadbeat engineer Herbert who has a chance of becoming moody and refusing to do anything resulting in you missing a turn. This can be especially annoying if your tank is going to blow up and the enemy has their go next. Overall, I think it's a good feature and one that encourages replays, although you have to be careful who you pick. Like Jagged Alliance and XCOM: Enemy Unknown, Valkyria Chronicles has permadeath although it's potentially more forgiving than other turn-based tactics games in that you're given an opportunity to revive fallen teammates if you're able to get another teammate to them within a few turns. The wounded teammate is evacuated from the field of battle which then opens up a spare spot in your roster if you want to receive a new reinforcement next turn. Alternatively, you can wait until the next turn and then request the same soldier as a reinforcement. Pretty easy to do if you're all within running distance of other teammates but you'll find that the reason your troops die half the time is mainly due to level design. The designers of Valkyria Chronicles must love puzzle games because ultimately, this is how each level of the game feels like. The designers of Valkyria Chronicles must love puzzle games because ultimately, this is how each level of the game feels like. Unlike Jagged Alliance or XCOM: Enemy Unknown where each map has similar objectives and similar rules, the rules keep on changing from level to level in Valkyria Chronicles. So just when you've become comfortable with a certain style, you'll get trololololed on the next level, because those rules won't apply anymore; You'll discover that a certain weapon is ineffective (e.g. when I tried using mortar support on a guy pointing an anti-tank gun, does he have an invisible shield over his head or what?) or that a certain elevator ride will lead you to your death or that you're meant to shoot a hole in the wall to make a bigger hole in order to drop a gangway to open up a new area. All these little "features" of the map you have to discover through trial and error usually means having to continually restore a save game and trying again (you have been saving the game regularly, right?). This is not a problem if the game was your typical puzzle game where each puzzle only takes a matter of minutes; since it's a turn-based tactics game though, it means battles can take a long time, even a couple of hours towards the end of the campaign. Just don't try playing this game on Ironman mode first up okay? I can foresee ragequitting in your future. I was surprised at how many high profile voice actors were recruited for the game. I was able to spot Steve Blum's voice immediately but he has a very distinctive voice and… really, I'd be more surprised if his voice wasn't featured in a video game – that guy gets around. Others include Dwight Schultz (The A-Team, Star Trek, etc. ), Kari Wahlgren (prolific video game voice actor), Fred Tatasciore (Zertaul in Starcraft II! ), April Stewart (South Park), Robin Atkin Downes (Prince Rurik from Guild Wars, as well as many others) and even John Di Maggio (Bender from Futurama). When I first started playing the game, the music didn't seem that special to me. There wasn't anything particularly wrong with it; it just seemed like generic battle music. However, the soundtrack has definitely grown on me especially because Hitoshi Sakomoto masterfully incorporated certain themes and leitmotifs into his music later on in the game, which is a nice touch. The original game came out in 2008 on the PS3 and it shows (can you believe that it's almost been 8 years since the game was originally released? ); cut scenes are of a low quality and I get occasional frame-rate drops on my Radeon HD 7850. Besides these minor gripes though, the graphics are great. I love the smoke effects; I love the comic book style onomatopoeia and I love the pencil-style shading (just pop a smoke grenade in the game to see what I mean). The PC version of Valkyria Chronicles has a lot of content; so despite me playing 38 hours to just finish the main campaign, there's also a whole bunch of "skirmish" missions I could've played not to mention you get a whole bunch of bonus missions that used to be separate DLC for the PS3 version of the game. You're also able to earn Steam achievements and Steam trading cards. In recent weeks, when quitting the game, it often crashes to Desktop for some reason and I'm not quite sure why – but since it doesn't seem to do much harm, I've just been ignoring the issue. Besides the issue with CTDs though, I didn't come across any bugs. I did find the interface a bit annoying for PC players though but I've come to expect this from games that are ported to PC. Navigating menus has to be done using the keyboard instead of a mouse, despite you being able to use the mouse in-game in other circumstances (e.g. mouselook while moving your troops or selecting units on the tactical map)! This is very cumbersome as what would normally take one click takes a combination of keystrokes instead. Also, if you're like me and often forget which key is which, you might accidentally end the turn, which often means having to manually close the game using Task Manager and restoring a previously saved game, since there's no way to access the main menu during an enemy's turn! If you managed to take a turn-based tactics game that merged the mercenary management of Jagged Alliance along with the research management of XCOM, and then set it in WWII, you'd have something that pretty closely resembles Valkyria Chronicles. While I have a love/hate relationship with the gameplay and the graphics are looking slightly dated nowadays, there's no denying that overall, I enjoyed Valkyria Chronicles. I'm glad they decided to release the game for PC and hope Sega decide to release more Valkyria titles on PC in the future. Is the game worth $19.99 USD? : Yes. Considering how many missions there are, the high production values and the heaps of extra content included, this is probably worth $40 AUD.